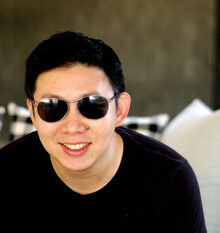 Aun Koh ’96: “I’m a huge food lover, to the point of being obsessed.” PHOTO: SU-LYN TANThe tagline of Aun Koh ’96’s food and travel blog, Chubby Hubby (www.chubbyhubby.net), is “dining, whining, and marriage.” But Koh has little to complain about. The Singapore-based events, marketing and media consultant regularly travels the world with his food writer/editor wife, Su-Lyn Tan — and his blog is a litany of his enviable experiences in at least 12 countries. Koh’s enthusiasm for the good life perhaps is one reason that Chubby Hubby attracts 270,000 hits per month and has been cited by The New York Times, South China Morning Post and Newsweek. In August 2006, during his nationally televised National Day Rally speech, even Singapore’s Prime Minister, Lee Hsien Loong, mentioned the blog as an example of Singaporeans in cyberspace. Surprisingly, considering its popularity, Chubby Hubby began as a mere “experiment.” In early 2005, while working for Singapore’s National Arts Council, Koh was planning a writer’s festival. In the process of seeking out bloggers to serve on panels and help promote the event, he came across “amazing” and “highly addictive” food blogs such as Nordljus and Chez Pim. Before long, he wanted to start his own. Blogging was a natural choice for this media expert. While at Columbia, Koh, who grew up in New York City, Washington, D.C., Singapore and Europe, was chairman of The Federalist (a student-run newspaper), which gave him “a taste for journalism and helped open doors to internships at the International Herald Tribune and Newsweek.” After graduating, Koh spent nine years on the editorial and business sides of several Singapore-based publications, including Dare, New Man, Lookbook, 24/7, Millenia, EnV, Shopping!, East Magazine, Where Singapore and Asia Inc.
For Koh, food was the ideal subject for his blog. He remembers polishing off a tray of pate de foie gras-topped toasts at a Manhattan Christmas party when he was just 8. At Columbia, where he studied political science, Koh and fellow students even founded special-interest housing in Wallach centered around cooking. The group’s “whole idea was to reexamine the age-old notion of bonding through cooking and cooking together, which was something my co-founders and I thought was being lost in American society,” he explains. As for the blog’s name, it came from the popular Ben & Jerry’s ice cream flavor that features fudge, peanut butter, pretzels, vanilla and malt — a flavor Koh likes so much that his wife “banned” it from the house (Koh jokes that he’s “quite a bit bigger now than I was in college”). As for the site’s content, the couple’s goal is to “share the joy of eating well and eating with people you love.” He and Tan, who authors 10–20 percent of the posts, describe what they “have been up to in the kitchen,” where they’ve been dining and “other inanities” that they “feel like posting.” Story ideas come from “everywhere,” including travel, restaurants, conversations and cookbooks. The current site includes a wealth of posts on everything from stylish Thai hotels to red velvet cupcakes to Singapore restaurants for everyday dining, as well as Koh’s impressive photography. No mere hobbyist, he sometimes takes on professional assignments, such as Lonely Planet’s World Food Guide to Malaysia and Singapore. Koh would love to create a social networking site, complete with a classified ads platform, for foodies worldwide. Dina Cheney ’99 is the author of Tasting Club, as well as a freelance writer/recipe developer and tasting host. She is at work on a cookbook. For more, see www.dinacheney.com.